Re-connects one to universal energies. For those feeling discouraged, disconnected or abandoned. Transforms a detached, lazy or apathetic state of mind into an energetic, positive and happy state of mind. Boosts the mood of those who feel low when there is no sunshine. For those who have money issues or who over-identify with their possessions. They may feel they can never have enough of anything, hoard everything or fear being deprived of their physical resources. When these people do have money they very often fear spending any in case of future problems. Agapanthus essence transforms poverty consciousness into abundance consciousness. It promotes a positive outlook, trust in the Universe to provide one’s needs, and a willingness to receive. Balances emotional extremes. Helpful in times when there are high demands one’s energy reserves. Restores a sense of balance and moderation. Instils inner confidence. Alleviates feelings of discontent, uneasiness and frustration. Use to help one rebound from every setback in life. Calms the mind and nerves, especially where there is a tendency to overindulgence in food, addictive substances or activities etc. to "get by". Use when you need to focus, but are being distracted by external influences, the environment or one's circumstances. Instils belief in guidance and protection from higher realms, especially in those who feel cut off from spirit in times of crisis. Reinforces resistance to giving up hope in difficult times. Helps us to face the unknown with courage and hope in our hearts, and stimulates trust in the Universe to supply our needs. Promotes intuitive sensitivity in those who are overly logical or intellectual. Helps to anchor divinity from the angelic realms into the human realm. 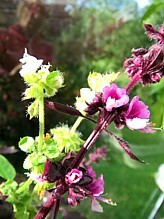 This unique essence combination of Purple and Lime Basil flowers overcomes a "I can't think straight" reaction and a tendency to "freeze up" when one is faced with a crisis, dangerous situations or self-imposed challenges. The essence is not designed to calm or remove fear. Instead it promotes mental alertness and a "quick fire", non-panic, mercurial response to a challenging situation. It also reminds one to "belly" breathe deeply during a crisis, in order to get a plentiful supply of oxygen into the brain. A few drops can be taken by mouth or massaged into the solar plexus and third eye chakras before exams, job interviews, sports challenges or races, and before/after possible life-threatening situations. Links to the nervous system, stress, blood, lungs, blood sugar, circulation. Aligns the mind with the will. Aids those who are having difficulty in manifesting their projects, because of unrealistic expectations or ambitions, and those who have difficulty in putting their ideas into practice. Deters procrastination. Encourages decisive action. Stimulates initiative and overcomes inertia, lethargy, and mental fuzziness. Links to the meridians connected with the element of earth, circulation and metabolism. A calming and cooling panacea for whenever life is too stressful, and you are finding it difficult to cope with the pressure. For over-excitement, angry outbursts, grumpiness, stress, injury or trauma. Bluebell essence opens channels of communication and connects one with the higher self. Instils confidence and self esteem, especially if you are feeling vulnerable to others’ judgments. Releases old programmes. Combats shyness, alleviates fear or panic. Calms temper tantrums and soothes a full-on fractious child. Links to throat, thyroid, parathyroid, larynx, panic attacks, emotionally caused speech disorders, lung and kidney meridians. Enhances communication skills. Develops understanding, warmth, receptivity and benign compassion in the active and receptive modes of communication, especially in dialogues between men and women. Helps those whose use of the spoken word often deteriorates into argument, sharp words and verbal abuse. Calendula essence improves the comprehension of another's communication. Deters one from making an incorrect interpretation of another’s words due to lack of empathy, not properly listening to what is being said, or making an assumption before the other person has finished speaking. Helps one to adjust to new ideas during periods of consciousness raising. Links to throat chakra, hearing, wounds, tissues and muscles. Helps those who seek external spiritual highs though escapism, addiction, occult practices, charismatic leaders or gurus. Releases a sense of powerless by connection to one’s own inner guidance. Develops intuition. Encourages recognition of one’s own talents and abilities. Improves attention span, assimilation of what one is learning, and the ability to learn from one’s past experiences. Helps one move forward with the activities you wish to develop and safeguards one against being too dreamy or impractical. Links to solar plexus, gold assimilation, nerves, knees, eyes, ears. Calms over-sensitivity and soothes raw nerves. Use Chamomile essence to overcome nervousness, moodiness, anxiety or insomnia. Promotes emotional stability, serenity and stillness in those who are easily upset, tetchy, hyperactive, restless or irritable. Releases emotional tension. Links to peripheral nerves, solar plexus chakra, stomach muscles and digestion. For workaholics. Helps release the belief that one’s life is meant to be dominated by work and external demands. Encourages one to make time for relaxation and leisure activities. Releases long-held grudges and ancestral resentment. Neutralises emotional damage caused by childhood deprivation. Encourages forgiveness and positive thinking. Assists assimilation of new energy vibrations from higher realms, to transform negative belief patterns. Links to sacral chakra. This Dianthus essence is is a powerful combination of the dazzling variety of garden and alpine pinks from my Devon garden. The blossom colours are magenta, rose pink, pink and white, white, and white and maroon. They go by the inspirational names of India Star, Brilliant Star, Can Can, Mendlesham Minx, Pop Star, Starburst, Coconut Sundae, Candy Floss, Showgirl and Moulin Rouge. The photo above is of the very pretty Moulin Rouge, which has the typcial wonderful clove aroma of an old-fashioned garden Pink. Dianthus is just the essence for providing that shot of much needed energy to keep you going whilst you are dealing with an emotional issue that has been dragging you down and causing fatigue. It does this by helping you to focus on living in the present moment, whilst detering you from keeping on burying your emotions or scattering your energies in lots of different directions. Dianthus essence is particularly helpful following a past or present traumatic incident or emotional upset. It dispels a loss of interest in life, and that feeling of numbness that arises when one reaches the stage of not caring any more. This essence works on the base chakra to gently ground and stabilise one. It promotes rational thinking to deal with emotional problems that arise, and it lessens spaciness, mental confusion and forgetfulness. Stimulates resilience, powers of recovery and mental rejuvenation to those of a more advanced age. Helps to restore the feeling of magic to life when one is feeling jaded or joyless. Instils wisdom and ability to rise above a situation. Overcomes judgement. Strengthens nervous system, even when one is in a very stressful situation. Restores hope in those that have had their dreams and beliefs shattered. Helps to break up energy blockages. Elderflower essence links to senility, memory and cognition. Forsythia supports new beginnings and is a catalyst for change. Helps one adapt to earth frequency changes. Releases emotional debris and transforms self-destructive patterns. For those who feel powerless to change their situation. Helps those who are in dysfunctional relationships to let go and move on, instead of suppressing their feelings. Links to crown chakra. Gardenia prepares one for a significant life change. It supports spiritual evolution and helps one to prepare for the future, in order to achieve personal goals. It promotes creativity, inspiration and achievement. It brings clarity and understanding to one’s thoughts and feelings. It is for moving one through a cycle and letting go a part of one’s life. It is invaluable in helping one to let go of an unrewarding job or relationship, or to cut family ties that no longer serve a beneficial purpose. It also helps those who are resisting a peaceful transition when the body is ready to die. Eases extreme sorrow, trauma or heartache from the departure or death or a loved one or from a broken romance. Calms extreme emotion that may eventually have an impact on the physical body. Also helpful for those who are type A aggressive people, who expect to get their own way, and who become easily agitated or stressed when their personal desires are not satisfied. Releases resentment and bitterness or a sense of abandonment arising from a failed love relationship or loss of a parent in childhood. Nurtures the emotional body and promotes serenity. Strengthens the etheric body. Links to heart tissues and immune system. 2000 years ago, when Joseph of Arimathea was walking on Wearyall Hill in Glastonbury, England, he noticed that his staff was sprouting tiny green buds. Certain trees, such as the Willow, are known to retain sap in their stems for a very long time. Canes made from their stems will readily take root in the ground, even after a period of time, if they are used as support canes for plants. Joseph’s staff, made from the Palestinian Hawthorn (Crataegus monogyne biflora) had absorbed moisture from the air in the much damper climate of England to enable it sprout new shoots. Joseph took this happening as a sign that the staff was telling him to put down permanent roots in this new land, far from his place of origin in the Holy Land. So Joseph drove his staff into the sodden ground on an earth energy line, and it grew into a tree. A Palestinian Hawthorn lives for around 100 years, but as the tree does not set seed In England, grafts have been taken from the original tree down through the ages. Despite vandalism through the years, the last one taking place on 8th December 2010, many grafts of the original tree have been grown, not only in many Glastonbury locations, but also in sites around the world. This Holy Thorn flower essence was made from the Wearyall Hill tree in May 2009. It instils resilience, perseverance and tolerance of difficult conditions you may be having to experience. It helps one to overcome obstacles in one’s path by being flexible and working around the problem. It encourages one to maintain belief in heartfelt desires, and to keep on going until those wishes are met. It’s main message is to try, try and try again. It gently soothes heartache away, and helps one to overcome devastating trials, such as the loss of one’s llivelihood, oved ones, home or health. It offers one the strength to pick up the pieces and start afresh after a disaster, where you may have been forced to move to a new living place or a new country. Promotes self-love, self-esteem and self-acceptance. Use Jasmine essence for those people who have a negative self-image and tend to be self-deprecating. It releases feelings of unworthiness and loneliness, and instils a positive outlook. Harmonises mind and body to bring confidence in helping you reach your goals. Links to mucus production, skeletal structure, cartilage and tendons. (Papaver commutatum)This essence is made from a new "Ladybird" cultivar that had its origins in the wild red "Flanders" poppy plant, that sprang up in such abundance in the fields of Flanders, following the great los of human life there during the first World war. Ladybird Poppy essence increases one's emotional warmth, and instils a strong sense of self-worth. It promotes the constructive use of anger to bring about positive and necessary change. It helps one to transform from being a hopeless victim into a strong, courageous and self-empowered being. It is a good grounding and centering essence, helping to release blockages in the base chakra. It helps one to set personal boundaries without guilt and also discourages self-destructive tendencies. It helps one to recover after an upheaval, knock-back or personal disaster. Links to female problems, menopause, circulation, heart, excessive sexual desires. Lavender essence calms agitated, overactive or distracted states of mind. It promotes mental clarity and enables to one to see through distractions. It transforms feelings of sadness, emotional instability or "being washed out" into feelings of comfort, composure and clarity during challenging times. It activates the crown chakra to increase keen awareness and alertness, and calms, strengthens and protects the nervous system. It cleanses the meridians and helps to remove karmic blockages that prevent spiritual progress. It also protects one's auric field from electromagnetic pollution. Cleanses at all levels. Overcomes negative thought patterns and removes unwanted energies. Promotes logic and pragmatism. Promotes mental clarity. Neutralises sexual or relationship trauma and releases associated feelings of blame or shame. Promotes cheerfulness in winter. Links to sacral chakra, psora miasm, assimilation of vitamins, S.A.D., palpitations, lymphatic system, hair, cholesterol levels, skin tissue, scar tissue, tooth enamel and bones. For spontaneity, vitality, inner radiance and freedom of action. Helps those who seek the approval of others by allowing their lives to be dictated by duties, obligations and social commitments. Dispels childhood conditioning and programming. Deters subconscious tendency to attract trouble or unnecessary drama. Encourages delegation, a simplifying of one’s life and an ending of any unnecessary duties. Facilitates reconnection to the energetic pathways that hold the codes to becoming a multi-dimensional human being. Links to throat chakra and heart meridian. For those gentle souls whose lack of confidence stems from their feeling of being different to others, because of their sensitive natures. They may be afraid to express their feelings in case of criticism. This essence nurtures and comforts one's inner child, stimulates self-acceptance, and restores inner confidence and understanding, especially where loved ones have tried to "toughen" one up to cope better with life’s problems. These sensitive types are often carers or healers, where their natural sensitivity and empathy can be valued as a gift. Narcissus is known as the "slayer of internal dragons". This combination, including Bridal Crown, Tahiti, Golden Ducat and Pheasant Eye Narcissi, helps us to face issues we are ignoring. It promotes the courage to face, deal with and overcome fears, frustrations, anxiety, constant self-condemnation, lack of action, bad habits and phobias. It also dispels butterflies in the stomach when facing fears. It aligns the subtle bodies, neutralises spiritual and emotional scars, clears blockages of the heart and deepens daily meditation practices. It overcomes insecurities and assists introverted, withdrawn individuals, or those lacking in social skills, to overcome their shyness or awkwardness. As well as oral use, a few drops can be rubbed onto inner wrists, the heart chakra or onto the temples. A few drops can also be added to water to help plants to grow under difficult conditions. Links to agrophobia, synchronisation between right and left brain, psychosis, digestive disorders, blood pressure, hyper-erratic depression, lessens heavy metal miasm. Brings calmness to extreme emotional states. Use Orange essence when you feel like you can’t go any more. Orange essence is a catalyst for emotional catharsis. Appeases frazzled emotions, discontentment and moodiness. Helps those who are going through divorce, death of a loved one, or have suffered a miscarriage. It helps to resolve conflict between family members. Releases emotional tensions. Banishes insecurity, hopelessness, despair, and past or present emotional or physical abuse. Renews hope, helps one to endure hard times. Promotes the ability to learn from past lessons, and to make wiser decisions in the future. Helps us to pick up the pieces and move on, following a difficult or traumatic experience. Dispels sadness, prevents energy leakages. Calms mind and clears confusion. 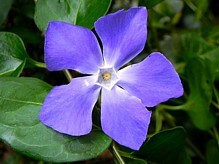 Periwinkle essence links to hypertension, haemorrhaging, nervous disorders, S.A.D., sacral and heart chakras and heart meridian. Helps those who procrastinate to get straight to the point. Good for public speakers. Helps one to focus, prioritise and eliminate the superfluous. Promotes enthusiasm and acuity. Instils insight and courage to overcome emotional blocks or states of denial. Eases nervous tension. Calms mischievousness and hyperactive children. Promotes meditative or creative skills when rubbed on the forehead. Links to nerves, speech impediments. This flower essence combination of wild yellow primrose with the deep blue Miss Indigo and the purple Primula acaulis, primarily promotes a "mind over matter" state of being. It helps one to prioritise tasks to be done in a logical manner, particularly where there are a number of tasks to complete in a limited amount of time, and a choice has to be made between opting for what the heart or the head wants to do first. It also promotes mental focus and determination to complete unpleasant tasks, especially where there is tendency to keep not doing them. It is a grounding essence that restores natural rhythms and stability. It is particularly helpful for people suffering from erratic, impulsive or obsessive behaviour, which may be being used to disassociate oneself from past trauma. It overcomes feelings of fear, anxiety and insecurity, and dispels any heavy, lethargic or "poisoned" feelings, particularly where comfort eating is involved. It instils light-heartedness in those who take life too seriously. Links to eating imbalances, diabetes, hypoglycaemia, hyper-erratic depression. Queen's Anne Lace has long been recognised for its ability to open the crown chakra , for enhancing the awareness of subtle influences that surround us. It also promotes discernment in those who tend to lack objectivity in mystical areas. It dispels imbalances in the brow chakra and helps to develop clear, undistorted clairvoyant skills. It calms the mind of those who tend to over-intellectualise. Queen Anne's Lace essence links to eyes, pineal gland, atlas and spine. Enlivening. Enhances memory and learning capacity. Promotes creativity, clarity of mind, perception, concentration and negotiation skills. For those who are forgetful, absentminded, disorientated, ungrounded, insecure or lacking in "get up and go". Rosemary sharpens the senses, strengthens the power of recall and realigns subtle and physical body links that may have been damaged by trauma, stress, abuse, drugs, illness or soul loss. Links to crown chakra, pineal gland, nerves, and cold hands and feet. Offers deep cleansing and a sense of renewal. Use Snowdrop essence when the future looks dark and dismal. Helps one to lighten up and let go of the fear of fear. Helps one to deal with rejection and move on. Promotes enthusiasm and hope in future ventures. Encourages trust and dispels a lack of security. Overcomes damage to inner child. Helps those who have become sexually withdrawn due to abuse in childhood. Stimulates inner strength. . Works on crown, throat, heart, solar plexus and base chakras. Links to kidneys and bladder, problems of old age, joints, mind, confusion. St. John’s Wort is an uplifting, magical essence, that draws light into one’s inner being to overcome sadness, feelling overwhelmed, unexplained fearfulness, insecurity, feelings of obscurity, fear of the dark, nightmares, psychic vulnerability and oversensitivity to environmental stresses. It protects one from an overly-expanded states of awareness. Use St. John’s Wort essence for those who are adversely affected by environmental stress, heat or light or lack of light. It uplifts the emotional body to calm fears, restlessness and nervousness. It instils courage and trust, releases tension and promotes calm, peaceful sleep. It restores and maintains the integrity of the one’s personal energetic field, by tightening up the filaments of light where they link to the solar plexus chakra. It restores clarity of mind and the ability to focus. It protects the psychically vulnerable from absorbing an overload of higher dimensional light during meditation, that could lead to "blown chakras" and an subsequent inability to filter subtle energies or close psychic channels. It also promotes spiritual awareness in those suffering from depression, due to a lack of contact with higher dimensions. It promotes increased tolerance to one’s surroundings and environment. Links to nightmares, fear of death, S.A.D., intolerance to environmental stresses, and night sweats or bed-wetting due to psychic attack or disturbed dreams. Protects one from invasion by entities and parasitic energies. Use Wild Garlic essence for fearful, vulnerable or easily influenced people, particularly those with low vitality, to provide resilience and active resistance to adverse influences. Neutralises negative thought forms. Mends holes or tears in auric field. Calms in stressful situations. Releases restless tension linked to fear, stress, apprehension and extreme anxiety, such as stage fright, phobias or taking an exam. Links to liver and gallbladder meridians, paraistes, solar plexus, tissue vulnerability, red blood cells, radiation, petrochemical and psora miasms. Yarrow essence protects those vulnerable people who are adversely affected by a negative environment. It strengthens the subtle boundaries of those who are depleted of energy though psychic toxicity. It repairs an over-absorbent, porous or torn aura, to create a strong psychic shield for those who are overly sensitive to the negative thoughts and desires of others.